If you have the need to track expenses across various clients and jobs, Expense Tracker is the application to use. Expense Tracker allows unlimited number of expenses to be associated with different jobs, while each job is associated with a defined client. Purchases as well as returns are able to be tracked within Expense Tracker. Each credit and purchase can be tracked in whatever currency the item was purchased in. With the automatic updates of exchange rates, these purchases are summarized along with other currency purchases to the base currency of the user. With more than 20 different payment types within Expense Tracker, you can track and report purchases for different payment types. Expense Tracker allows each expense to be associated with a tag for grouping expenses together. Additionally, the merchant from whom the purchase was made can be captured within Expense Tracker. With the additional notes field, details about the expense can be recorded. Maybe you purchased dinner for a number of guests and need to remember their names or you need to add justification for your purchase. Whatever the need, the notes field can help. If you device has a built in camera, a picture of the receipt can be added to the expense record with only two clicks. If your receipt is already in electronic for (PDF, Word, Excel, etc. ), Expense Tracker allows you to attach and view the receipt. 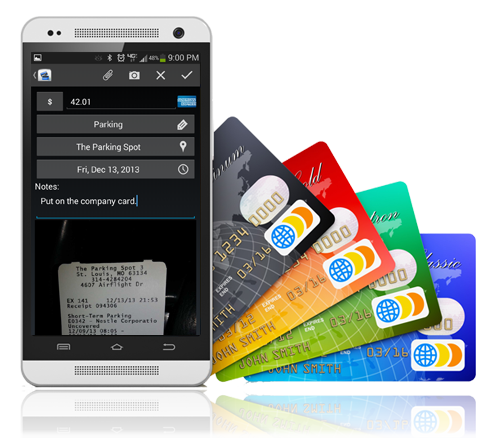 Payment management - as customer payments are received, they too can be tracked within Expense Tracker. These payments as well as due dates can be used to auto calculate job statuses. Extensive Reporting capabilities such as Job Details, Client Summaries, and Year to date reports are available. Addition Quick Reports easily allowing the generation of select reports within two screen touches. Tag Management that allows for creation and deletion of tags and tag groups. Expense Tracker is a great application for keeping track of expense that you have made while servicing a client. Most applications charge hidden fees through the use of their servers for report generation; not Expense Tracker. There are no additional charges beyond the purchase price of the application. If you already have the Expense Tracker application and you would like to add time tracking or mileage tracking capabilities, see the Time Add-On and Mileage Add-On items.